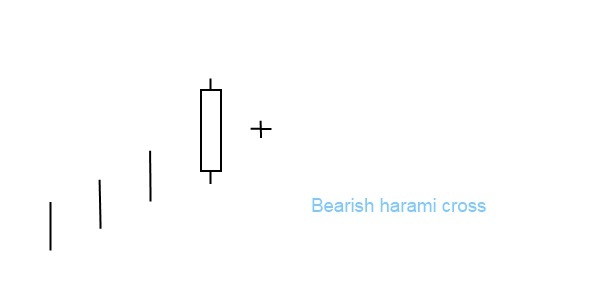 Bearish harami cross is a bearish trend reversal pattern. It has two elements: a large white candle on the first day that is followed by a doji. The first day candle completely engulfs the doji. The pattern forms in a prevailing uptrend and is even more significant than a regular bearish harami. Bearish harami cross – what happens on the market? An uptrend has been in progress and that trend continues with the first candle. The bulls drive the price higher, which forms the long white candle. The second day’s price range does not pierce the previous day’s range and closes about where it opened, thus a doji appears. Trading volume on the second day is low, which shows that traders are lacking enough information, there is indecision on the market. The bearish harami cross can be first two days of the rising three methods pattern.